A video of people in England chanting for Trump is the closest thing we could find to match the claim the president retweeted. It’s been clear for a minute that the burgeoning bromance between Donald Trump and French President Emmanuel Macron was on the skids (they didn’t even meet during a recent major summit in Argentina). But it was still a bit of a “...huhn” moment when Trump retweeted young conservative icon Charlie Kirk’s tweet talking about the recent protests against fuel price increases in Paris, specifically the claim that Parisians are chanting “We want Trump” in the streets. Radio host Rush Limbaugh also advanced the “We want Trump” claim on his show Monday, telling his audience that some “friends who are there” had filled him in on Paris’s Trump-loving populace. Things have definitely been rough in France the last few weeks, where “gilets jaunes” — or “yellow vests” — protesters have set fire to cars and attacked the Arc de Triomphe as part of their rejection of rising fuel costs and Macron’s policies more generally. But a recent poll shows that the French still find le président rather passé: Only 10% of those polled last month had a positive impression of Trump. And the closest BuzzFeed News came to finding a source for Kirk’s claim is this video posted on Twitter on Monday, claiming to be from France, which has more than 17,000 retweets. 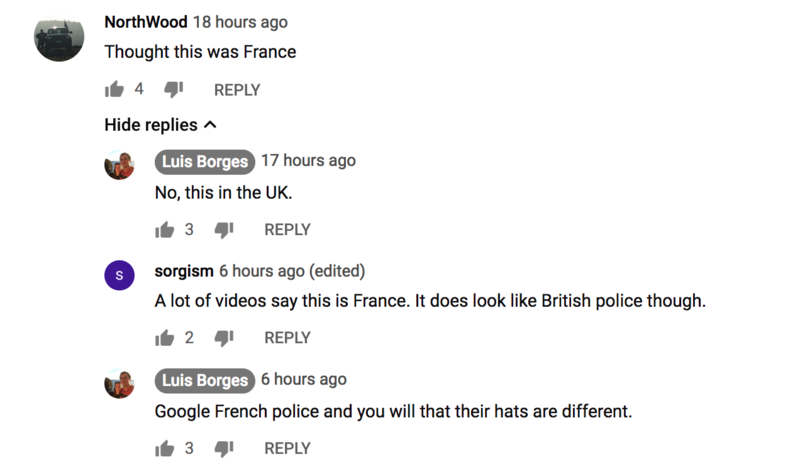 But a copy of that video posted on YouTube clearly states that the video came from England, as is easily discerned from — among other things — the police uniforms, the English flag that’s briefly seen in the crowd, and the fact that THEY ARE SPEAKING ENGLISH. As of Tuesday afternoon, both Kirk’s tweet and Trump’s retweet were still live with more than 15,000 retweets.